I do not see how it is possible to miss the import of this statement by Jesus, but it is missed by many. Jesus prays and asks the Father to sanctify us through the truth of His word. God’s word is the truth, the standard by which anything true is to be measured. Allow an illustration to show the difference between ‘truth’ and ‘true. When a bicycle wheel gets “out of round,” it needs to be straightened, or what is called ‘trued.’ The process of truing gets the wheel to turn straight without any wobble. A truing stand is used for the process. The truing stand is the TRUTH by which the wheel is measured to be ‘true.’ Picture a rod held steady on a post placed next to the free-spinning wheel. As the wobbly wheel is rotated, the parts that are out of line will move closer to or farther away from the rod—the truth. Once the wheel is aligned properly by tightening or loosening the spokes, it will run ‘true.’ It is ‘true’ as measured by the ‘truth’ of the stationary rod. With the bicycle wheel, if there is no standard against which to measure it, then there is no way to get it properly aligned. When your life is “out of round,” it needs to be ‘trued.’ And, just like the bicycle wheel, your life needs a standard against which to measure for trueness. That truing is accomplished by measuring, and then adjusting the life up against the rod of “truth,” which is God’s Word. Without that truth—standard of measure—you could possibly get your life working reasonably well. Most folks have. But, it will not be perfectly aligned. We use a “standard of measure” consistently in our lives in order to have things turn out a certain way. A ruler is a standard of measure. There is a standard measure of a cup. If you just used whatever coffee cup you found at the moment to measure the ingredients, your baked goods would never turn out the same. If you only use whatever you find in the moment to guide your life, there will be little consistency and even less growth. Doing that which is right in your own eyes (Jdg. 17:6), based on the latest information you garnered from a book or social media, can only result in a haphazard mess. It is the Word of God that works to bring healing to your soul and health to your spirit. The Word of God is the Bible. It cannot be stated any more plainly than that. 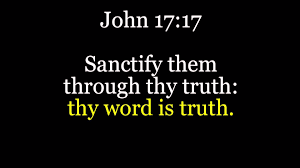 If we are to be sanctified by the truth, as Jesus said, then we are to avail ourselves of that word. “The words of the New Testament are eminently the στοιχεῖον (stoicheion) [elements] of Christian theology, and he who will not begin with a patient study of those, shall never make any considerable, least of all any secure, advances in this: for here, as everywhere else, sure disappointment awaits him who thinks to possess the whole without first possessing the parts of which that whole is composed.” (Synonyms of the New Testament, Preface, page iv, pdf [bracketed ‘elements’ my added note]). The Lord will have a sanctified people, but it will only be those who have availed themselves of the means He has provided.